Located in El Chalten, Poincenot is a 3-minute drive from Capilla de los Escaladores and 6 minutes from Salto El Chorrillo Waterfall. This hotel is 3.6 mi (5.8 km) from Viedma Lake and 21.6 mi (34.8 km) from Chapel of Our Lady of Loreto. Enjoy a meal at the restaurant or snacks in the hotel's coffee shop/café. Need to unwind? Take a break with a tasty beverage at one of the 2 bars/lounges. A complimentary buffet breakfast is served daily from 7 AM to 10:30 AM. 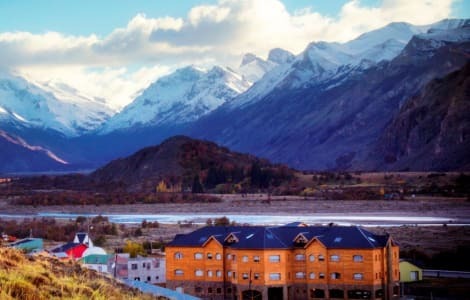 When you stay at Estancia La Quinta in El Chalten, you'll be in the mountains, within a 5-minute drive of Viedma Lake and Capilla de los Escaladores. This country house is 4.6 mi (7.4 km) from Salto El Chorrillo Waterfall and 24.1 mi (38.8 km) from Chapel of Our Lady of Loreto. At Los Cerros Boutique Hotel & Spa by DON, enjoy a satisfying meal at the restaurant. Quench your thirst with your favorite drink at the bar/lounge. A complimentary buffet breakfast is included. The hostel is located in El Chalten within Los Glaciares National Park, at the foot of Mount Fitz Roy. The location is strategically close to tourist attractions, such as the Rio Gallegos, which is 5 minutes by car, and Lake Viedma (15 minutes). The lake tower is approximately 8 km from the hotel and it offers wonderful views of the beautiful lakes in the area, including Laguna de los Tres and Laguna Capri. The Perito Moren Glacier tourist centre is around 30 km from the hotel and El Calafate is roughly 22 km away. The guesthouse features typical Patagonian architecture, inspired by the old 1920's farms, which is combined with all the comforts of modern hotels. It offers various services, such as a hotel safe, currency exchange, cloakroom, Internet access, room service and a laundry service. Further facilities at the air-conditioned, 21-room hostel include a lobby with 24-hour reception, a newspaper kiosk, TV lounge, bar, breakfast room and a guest car park. The hostel is wheelchair-accessible. The rooms offer comfort, warmth, privacy and tranquillity. The spacious rooms feature an en suite bathroom with shower, bathtub and hairdryer, a king-size bed, and a kitchen with fridge, cooker, microwave, and tea and coffee making facilities. The rooms are suitable for disabled guests and other in-room amenities include Internet access, a washing machine, ironing set, central heating, air conditioning, a safe and a direct dial telephone. A breakfast buffet is offered each morning and lunch and dinner are served à la carte. lastminute.com has a fantastic range of hotels in El Chalten, with everything from cheap hotels to luxurious five star accommodation available. We like to live up to our last minute name so remember you can book any one of our excellent El Chalten hotels up until midnight and stay the same night.